We had a wonderful time in France, as ever. Wandering down the country to Burgundy for a week in one gite and the Limousin for another, with a couple of B&B stops on either side. If you're really interested, have a look here for more about the holiday. The usual problem presents itself: keeping some level of fitness and weight control while chilling out! 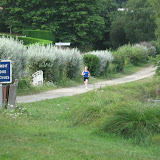 I took trainers and Nike+, and at least managed four runs - two at each of the gites. It was desperately warm most of the time, but I was determined to do it... Pace wasn't too bad considering the heat - around 10:30 to 10:45 in each case (according to Nike+). The Burgundy week was in a gite in a tiny village, and I calculated that the circuit of the whole village was just under 1.2 miles. So my first run was one circuit, my second one was two. A couple of tough little hills, especially on the home stretch.